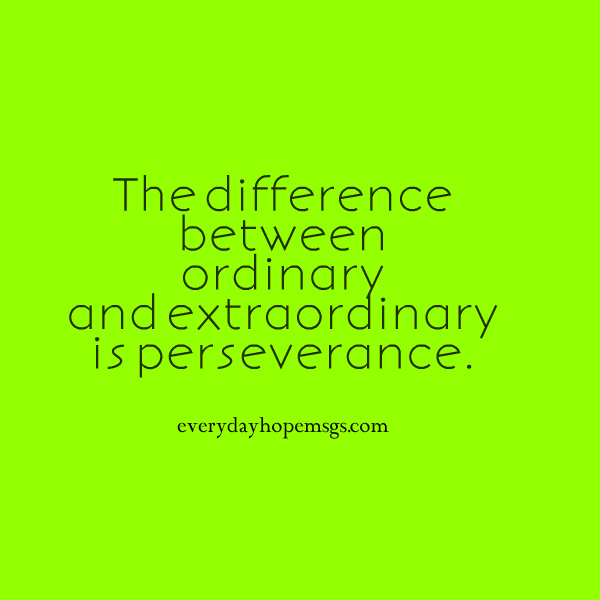 The difference between ordinary and extraordinary is perseverance. Extraordinary uses stumbling blocks as stepping stones and transforms negative circumstances into positive possibilities. Extraordinary is within reach as long as you have the will to persevere. It’s easy to feel fatigued by multiple obstacles and extended battles. Pain and pressure may seem unbearable at times, but challenges pass. Your choices matter; they build a foundation of character. Your faith is a well of hope in the toughest of times. There are days where you’re forced to discover your own strength, purpose and might. And with these things, your eyes are opened to the fact that YOU are extraordinary. You are a Warrior and an unsung hero. Look how far you’ve walked and the challenges you’ve overcome. Your story is one of vibrant courage, silent strength and unending hope. You are stronger than you could ever imagine. Today, relish in what you’ve accomplished and envision the positive possibilities your future holds. Allow joy and gratitude to wash away any remnant of pain and choose to see how strong you really are. The difference between ordinary and extraordinary is the hard work you put in.